Dormitory rush for the fall has been tentatively moved back to orientation week because of student concerns about a lack of time for in-house rush, said Orientation Committee Chairman J. Kim Vandiver. 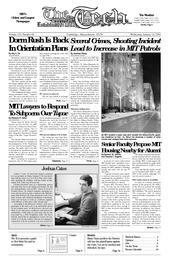 A rash of crimes near MIT has resulted in increased patrols by the MIT Police. “A group of faculty came together and are interested in concepts expanding the possibilities” of living around the MIT community, said Provost Robert A. Brown. According to the Bismarck Tribune, Josh was a passenger in the back seat of an automobile driven by his younger sister. At about 8 a.m., she lost visibility in icy and snowy conditions, and slowed the automobile, a 1986 Audi, to a near stop. The car was rear-ended by a 2000 Freightliner truck. The driver told the patrol that he attempted to swerve but was unable to avoid the vehicle, and was not charged in connection with the accident. Lea was treated for injuries and released. The freightliner driver was not injured. All three were wearing seatbelts. As they face a rising tide of applicants who look highly qualified on paper, a growing number of selective colleges are trying to solve the same problem: how to look past high school transcripts and test scores to find the students who will thrive on campus.